Crawfishing is super important to us, as you can tell. Knowing a little bit about the history and how our crawfishing has evolved is important. It helps you to truly appreciate what you’re doing when you’re out on the river, stream, or lake doing what North Americans have done for centuries now. Crawfishing has been used as a way to catch a sustainable source of seafood in North America for hundreds of years. The Native Americans from the Pacific Northwest, to the Southern Gulf States, across the Midwest, and along the Eastern seaboard all knew of the tasty treats that could be found in lakes, rivers, swamps, and estuaries. North America has about 300 of the 500 different species of crawfish worldwide. Crawfishing became big money in Louisiana where 90-95% of the United States commercial crawfish production resides now. Texas, the Carolinas, California, and Arkansas also have sizable crawfish productions. The commercial crawfishing industry includes both wild caught and crawfish farms. It was the Cajuns that became synonymous with the crawfishing industry. It is very interesting to discover their history. 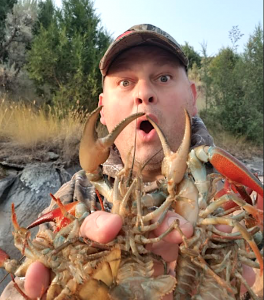 In Oregon and Washington there is also commercial crawfishing, but everyone traditionally know about Louisiana crawfish and ask for them rather than utilizing local crawfish which are the large signal and northern crawfish (nearly twice the size of the typical red swamp crawfish). The Native Americans used to bait reeds with deer meat and pull them in from the water when a crawfish grabbed the bait. The French settlers of Louisiana wrote that the Houma tribe used a red crawfish as its symbol. Chakchiuma means red crawfish in their native language. They used the symbol in war because crawfish raise their claws when threatened instead of backing down. We do know the Iroquois would cook lobster by wrapping them in seaweed and putting them on stones to bake. The Natives Americans all over North America would put the crawfish on hot stones that had been warmed in fires to steam the crawfish meat in its shell. Crawfish were considered a very good protein source for the young, elderly, and sick. Perhaps, because of the omega threes and how tender and sweet the meat is once cooked. Ancestors of the Cajuns were from coastal France that suffered many hardships of famine, plague, and religious wars. Ten thousand left for Acadia (now Nova Scotia, New Brunswick, Prince Edward Island and a part of Maine) as indentured servants. Fisherman, farmers, and trappers worked 5 years to pay off the transportation and cost of materials for the Company of New France. They lived alongside the First People of the area and learned much about their hunting and fishing habits. The Acadians were Catholic and in 1755 the British deported them by the thousands in cargo ship holds for not pledging allegiance to the King of England. Many ended up in Louisiana where they lived along the swamplands and gulf region which was controlled by Spain by the 1760s. Spain was trying to form settlements in Louisiana and many Acadians took them up on the offer of tools, seed corn, livestock, guns, medical services, and a church in the fort. As a group, they learned once again from the Native Americans how to survive on the lands of the region. Most Acadians now dubbed Cajuns farmed, hunted, and fished. In the 1800s, Cajun settlers modified lobster recipes passed down from their coastal Canadian forefathers, substituting them with crawfish. In 1803, the people of Louisiana became citizens of the United States through the Louisiana Purchase. There are around 1600 Louisiana crawfish farmers in Louisiana that produce 130-150 million pounds of crawfish annually with a combined value of $172 million dollars. The first record of a commercial crawfish harvest was in 1880. The catch was 23,400 pounds valued at $2,140. By 1908, the crawfish production nearly quadrupled, but crawfish prices didn’t as the value was $3,600. During the Great Depression with the development of improved transportation and cold storage local consumption of crawfish expanded to higher volume markets like Baton Rouge and New Orleans. At the same time, introduction of wire crawfish traps resulted in much more efficient methods of harvest. Up until this time, most crawfish were wild harvest from natural habitats. In the Pacific Northwest, the crawfish has been a quiet star. Its status was guaranteed by a mix of cultures from Scandinavians who came to fish to Southerners who migrated for work in the timber industry. 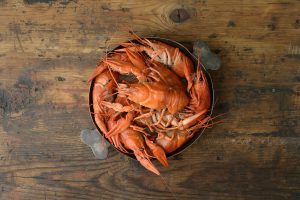 Crayfish fishing didn’t gain momentum in Washington state until the late 1960s when fishermen responded to demands from Sweden, whose crayfish had been depleted by disease. That effort later about 3 years and most of the crayfish were sent abroad. It ended with public outcry against the fishing boats in lakes and streams and restrictions were placed on commercial crayfishing. Only 3,800 pounds of crayfish were caught commercially in Washington in 2014. Oregon has the longest history of crayfishing in the Northwest the harvest from the late 1980s was 217,000 pounds. Most of the catch stays in the Northwest. Believe it or not there is a restaurant in Portland, Oregon that has served crayfish since 1892. Today, our population is a huge mix of cultures. Although cooked in many ways now, most crawfish are sourced by farming. Crawfish are purchased from fish shops, grocery stores, or even sent overnight fresh from crawfish farms straight to your doorstep. More and more people are going out and catching their own crawfish. With the innovations in personal crawfishing gear many are getting fresh crawfish straight from the lakes, rivers, and streams near them. Rising seafood costs and ocean pollution is making this option more and more appealing. People are realizing how abundant and easy they are to catch. However people are sourcing their crawfish today everyone agrees on one thing, people still love crawfish! Eating crawfish today is associated with good times, gathering with friends and family, slowing down, enjoying a great day, and good food. That’s what it means to us too. Just plain old good times. Excell3nt job Mike on ypur creatuon of thr Crayster platform site,traps and all. This is a very good thing you did which has positive impact in America and thorought the world. (1) How large are the Northern Crayfish as compared to the Signal Crayfish? (2) I take it that the Signal Crayfish are probally amongst the Largrst species of Crayfish in America? Are there other sprcis tgat get just as big or bigger in North America to your knowledge? (3) I am concerned about the pollution, effects impact on consuming crsyfish; fertilizer run off effecting crayfish where I live as yeas ago I’d catch some in a creek which had municipal concrete round tunnel pipes on its side. As in a, Reservoir that is somewhat connected down from a golf course and adject a Highway where there is runoff of fertilizer,pestisides . I am concerned and have avoided catching crayfish there. Probally taking a sample of the water in the area and testing it would be best. (4) If possible I’d like to know about the possibilities of becoming a corroborating Field Researcher and entering to attend your upcoming 2019 planned Crayfish festival Party. Thank You Very Much for probagating this much unexplored useful field of Crayfish, Stay Safe out there!